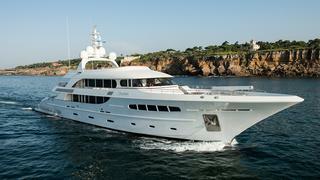 The 49 metre motor yacht Nassima, jointly listed for sale by IYC and Fraser, has had a €2,000,000 price reduction. Built in aluminium by Dutch superyacht yard Acico Yachts, Nassima is ABS classed and was launched in 2012. MCA coded, her accommodation is for 12 guests in a master suite, VIP stateroom and four twin cabins, all with entertainment facilities and en-suite bathroom facilities. A classic, timeless interior design by Oliver van Meer features an extraordinary stern garage with room for a car and two motor bikes, as well as the spacious sundeck with every amenity for al fresco entertaining and dining. The interior boasts a warm, modern design combining cosiness with grand luxury and contemporary class. Cream carpeting and dark wooden flooring form the main ingredients of the colour scheme with touches of gold added throughout. The main saloon of this yacht for sale has a lounge area with comfortable seating, an entertainment centre and bar with a formal dining area forward. An unusual feature is the aquarium separating the saloon from the aft deck. The aft deck has built-in settees, chairs and a table offering a relaxing ambience for outdoor living. Twin 2,365hp Caterpillar engines give her a top speed of 18 knots and a cruising speed of 14 knots, while her enormous range at 10 knots is 8,600 nautical miles, making her a true long-range yacht. Lying in Italy, Nassima is now asking €15.9 million.